This product is intended to provide dogs and cats with pure free fish oil containing the health-boosting omega-3 fatty acids eicosapentaenoic acid (EPA) and docosahexaenoic acid (DHA). The natural way to healthy skin, a lustrous coat, flexible joints, abundant energy and proper brain, heart, eye and immune function. Many commercial pet foods contain highly unbalanced ratios of fatty acids, namely excess amounts of omega-6s derived from vegetable oils. Most have inadequate amounts of EPA and DHA. This imbalance, and lack of omega-3s, can contribute to many health disorders, including inflammatory skin disease, infertility, growth problems in young animals, and defective development of the nervous system. As a daily dietary supplement, give 1 softgel to small dogs and cats (under 10 lbs) 1-2 softgels to medium-sized dogs (10-30 pounds); 2-3 softgels to large dogs (30- 60 lbs. ); and 3-4 to larger dogs. Prick softgel and mix into food or feed whole. 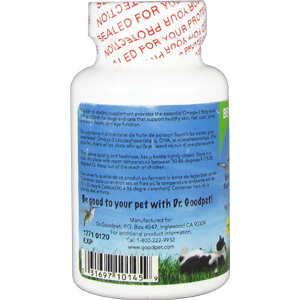 Omega 3 vitamins are a very important part to pets health and this contains pure fish oil and that is essential. 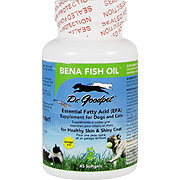 If you take fish oil get these for your pets for great health to the pet you love. 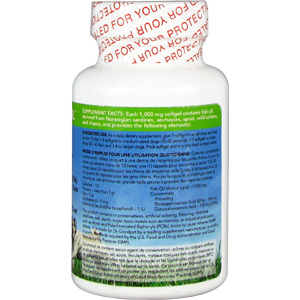 Bena Fish Oil is shipped in a discrete, unmarked package. Orders are processed immediately and usually take about 3 to 5 working days to be received. Any information received is used only for order processing and shipping purposes. Your information, such as e-mail address, will never be disclosed to a third party.